Handsome farmer Chris Soules from Andi Dorman’s “The Bachelorette” season is equipped with charm and a manliness that’s not too rigid for the largest contestant pool yet! After Andi’s rejection, Chris was one of the few who did not shed a tear on his way back home, and remained hopeful that he would find the right woman deserving of his love. Fast-forward to a few months later, and we now have Chris Soules who is now calling the shots as “The Bachelor” of season 19. ABC’s “The Bachelor” is known for adding unsuspecting twists each season to keep the show fresh. This season, it’s giving Bachelor Chris more chances to find love than any other contestant…EVER! Five more in fact! The show increased it’s number of girls this season from 25 to 30! But, Chris will have to eliminate eight of those lovely ladies during his first rose ceremony. This Bachelor season premiere will also air a special live in-studio show with host Chris Harrison moderating. At 33-years-old, Soules explains in the season premiere that his very small town of about 400 people has very few woman in it to meet. His bio reveals that he’s been engaged before during a seven year relationship. Hopefully one of the women vying for his hand will get the full story about what exactly went wrong in that relationship. In the premiere opening of the 19th season of “The Bachelor”, hosted by Chris Harrison, Chris Soules states that “love is a lot like farming. You plant a seed and hope it grows.” He notes that the weather, however, doesn’t always cooperate! Chris is determined to find love this season, fall in love, and bring it back to Iowa. He’s determined to meet his soul-mate and wants to leave with a woman’s ring around her finger. This small-town boy is a fish out of water in the big city of Los Angeles where “The Bachelor” is filmed. In preparation for the show, he is fitted for sleek new suites over his typical rugged look of plaid shirts and jeans. Chris also takes-on some fitness training from a very memorable contestant also on Andi’s season, Cody! Pictured: Carly meets Chris Soules. It’s Time For The Ladies! More photos of the women from The Bachelor season 19! 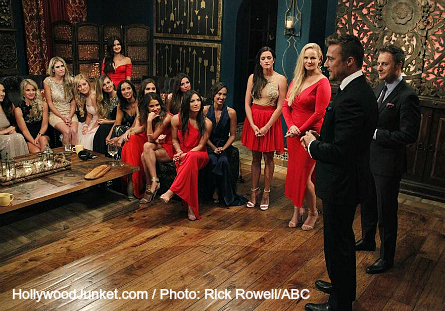 See photos of ALL of the women of The Bachelor season 19 here! 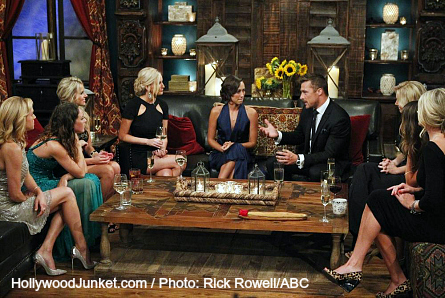 The show selected seven out of record number of 30 women this season on “The Bachelor” to profile. These women include a waitress from Los Angeles, a national news producer, a ballet teacher, fertility nurse from Chicago, single mother, flight attendant, and a school counselor. All varying in ages from 24 (who doesn’t cook or clean) to 29 years old. The women arrive in limos five at a time to meet Chris and aim to leave that lasting impression on him that will one-up the girl before her. Some props include a very “girlie” get-up equipped with a karaoke machine, as well as a pigs nose mask! One woman attempted to teach Chris a dance move, and another girl turned “secret admirer” game on him! As always with each season, there’s always that one stand-out “crazy” one. Well, she appears very soon from the start in this season premiere and viewers will be able to pick her out quickly. Chris Soules gets the attention of 30 ladies. 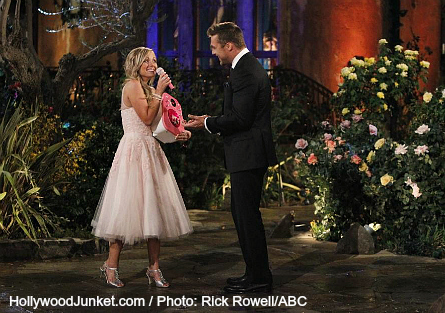 What is so addicting about the ‘Bachelor and ‘Bachelorette shows is witnessing that first bloom of love (or lust!) In some instances you can see the chemistry exploding off the screen right from the start! It was there with Josh and Andi from their very first meeting, and yes, it is also there for Chris and a young lady from their first meeting. Viewers will notice that she is the first one to come out of the limo, just as Josh was the first one to arrive in front of Andi. Hmmm….wonder it that is a sign of whats to come! 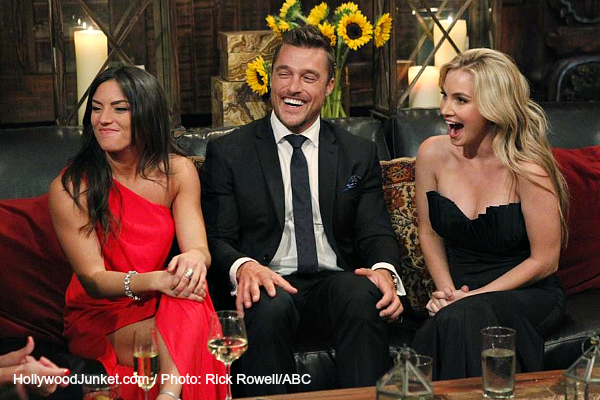 Chris Soules on his first date with Andi Dorfman from “The Bachelorette” here! – Andi discovers that Chris is her secret admirer who kept leaving her love notes. She was obviously hoping it was someone else (Josh). But, fans were won-over even more on Chris’ settle charm and romance. – During Chris’ hometown date, Andi, who is a city girl, couldn’t get over the fact that Chris actually owns a house. Yet, this still did not win her over. And, oh yeah, we all find out that he is not just a farmer, but a very successful and a wealthy farmer! – Chris had a plane fly a flag in the sky that read “Chris Loves Andi” during his hometown date. – After Andi told Chris that she does not love him right before the “Fantasy Suite,” he took it like a real man and said if she didn’t want him there, he didn’t want to stay and left the show that night without a tear in his eye. THE BACHELOR Season 19 Episode 2 Recap! Chris Soules with Ashley I.